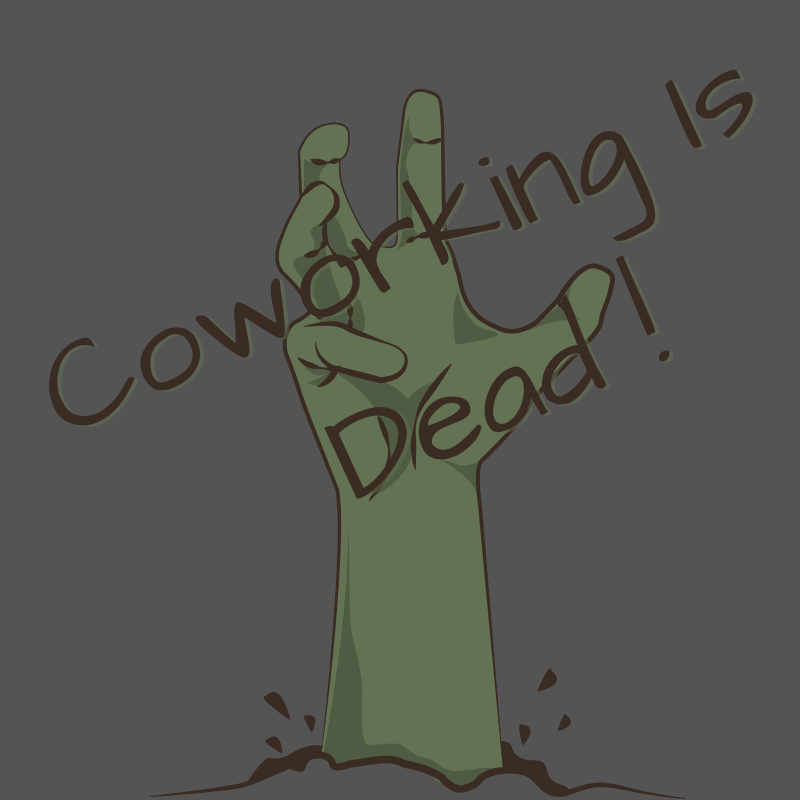 Coworking raises from the dead. Beware! Coworking is dead. I know it may sound a bit harsh and that it may lead to confusion. The practice of coworking is alive and kicking, but the name coworking has lost its sense. Anybody offering any kind of shared workspace is calling it coworking, although most of them don’t do any coworking. From the early days of coworking there was a community focus that differentiated coworking from traditional business centers that just provided hot desking. Let’s start with a definition of coworking that I wrote and used for the European Coworking Assembly when I was the president, and that was also approved (and ignored) by the then nascent coalition of Belgian coworking spaces. Call itself or the service it offers coworking. Have a fully dedicated space for coworking (not just a few hours or a cafeteria shared with patrons). Have an active community of members, not just clients. Have at least one facilitator dedicated to connect the members and build trust among them, engaging in activities to build the coworking community. Treat coworkers as 1st class clients. Promotes and encourage collaboration, interaction and serendipity. Offer one or many kinds of membership (full or part time). Does not discriminate who can become a member or how they can participate with hidden or implicit rules. These elements should be self evident, but they are not. I’ve seen websites of business centers that just had coworking written in white on white background, in an attempt to trick search engines. These centers did not use coworking to define their services because they saw it as a lesser offering, not worth it of the standing of their business. Many had absolutely no interactions among the members and did not want to get involved in anything beyond having a reception. Some said that they had a community because they included it in the contract (legal WTF). When meeting these spaces they said that it was not worth it to invest effort on the community side because it was a lot of work and they did not see a clear financial link to their profits (at a time where their businesses were losing clients and contracting). Most did not have a single person dedicated to the members beyond the reception. No connections, no event organization… Just mail, photocopies and telling visits where their meeting room was. They definitely did not do a single thing to promote any collaboration among the members. In fact for business centers this run against their core offering of a private office. Way too many treated coworkers as second class clients, as fillers of bad space that could not be dedicated to have an office and “real” clients. The discrimination part is trickier to evaluate, but some centers will not admit members based on personal preferences and discrimination, not on a public set of requirements. The beginnings of coworking spaces where mostly of ignorance, paternalization and dismissal by traditional office space providers and many professionals that did not understand the new service it was offering. Then WeWork arrived and managed to get the word coworking in media all over the world. They managed to turn hot desking into something cool by using a modernized design and the word coworking (although from my visits I saw that their buildings are mostly focused on providing offices, even single person offices). Me and many others fell for it too. We saw it as an opportunity to show that coworking was great and that it was a business. I shared messages in social media about their rounds and valuations as a way to promote my own space. Soon traditional business centers saw an opportunity to renew their offering just by changing the name, not by adding any value, riding the WeWork and the coworking wave. As the word coworking became more commonplace, everybody started using it for shared offices, for bars… for anything where there was the tiniest shared space. Many consultants wanting to become cooler towards corporations started naming their offices coworking spaces so that it would be easier to sell their innovation services and conferences, using the “coworking space” as a loss leader. Today the word coworking is well known but it is dead. It has lost all meaning. Except it is still alive in many real coworking spaces around the world, delivering value to the coworkers and dynamizing local ecosystems and economies. Real coworking spaces have a bright future ahead of them, because they deliver value to an ever growing number of independent professionals and small entrepreneurs. Some remote/displaced employees take advantage of them too, but their numbers are much smaller. There is a lot of work to be done with less and less jobs, that is being provided by independent workers and small companies that do the job done by bigger companies not so long ago. As long as coworking spaces focus on delivering value to the coworkers and going beyond a simple desk offering they will be able to compete and thrive. The biggest competitor of coworking spaces is still the home of the prospective coworkers, which is free. There’s no way to compete in price, the competition has to be in value. True coworking spaces walk the walk of community, they do not just pay lip service to it. If the clients just want a place to work, they can and will also join coworking spaces, and once they are in they will be trapped by the relationships being built and the opportunities that do not exist in other working spaces because they lack a community. There will always be challenges, as with any business, but because there’s a fundamental value offering attached to coworking spaces they have a meaningful future as businesses. If you want to create and grow the community side of your coworking space, I’ve created a course that will help you: the Coworking Community Challenge. Check it out and let me know what you think.